Welcome to Chaco Canyon Consulting! 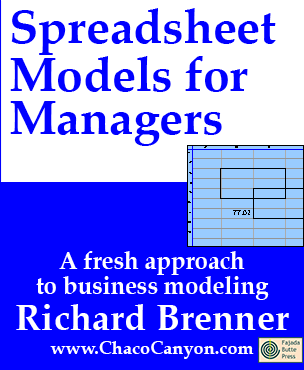 Resources for learning about modeling business processes using Microsoft Excel. Techniques include running sums and differences, charts, arrays and matrices, convolution, safety margins, and capital leases. This is a course about using spreadsheets to model businesses and business processes, from the perspective of a manager. It emphasizes both the modeling techniques, and the process of modeling itself. That is, we're not only interested in building models that managers need, but we want to build them in ways that are easily managed, and that give reliable and cost-effective results. In the form of a stand-alone Web site, it has dozens of examples. This product is available at our Web site. It includes three months of access and unlimited email support. This course was delivered to students in classes at Harvard Extension School, for 21 years, from 1993 to 2014. Although it is no longer offered there, I continue to update it with new techniques and new ways to approach business modeling using spreadsheets. Development is continuous. This online edition therefore has benefits compared to the downloadable edition, because we add improvements and make corrections continuously. It includes dozens of worked examples and homework problems, with solutions. Not just descriptions of solutions (though we include those, too) — actual Excel workbooks. Moreover, the solutions are far more than just answers. They come complete with narrative explanations which discuss alternatives and tradeoffs of different approaches. And when more than one approach is possible and instructive, the solution includes both. Relative and absolute references: what the heck are they good for? The Fast Food Drive-Thru: How long should the driveway be? This subscription is also available in a one-month term. This item is a subscription. To avoid shipping charges, be sure to select "downloadable" for the shipping method. Copyright © 2019 Chaco Canyon Consulting. All Rights Reserved.